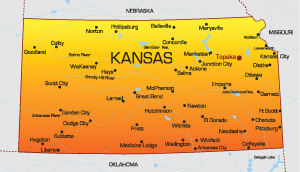 Kansas is named after the Native American tribes that lived in the land before it was established as a state. It is the 33rd most populous state in the United States with a population of almost 3 million people and is known as The Sunflower State. It is bordered by Missouri, Nebraska, Colorado and Oklahoma. The major highways serving the state are I-70, I-35, I-470, I-135 and I- 670. Other modes of transportation include air travel to and from Wichita Mid-Continent Airport and Kansas City International Airport. Notable colleges in the state are Kansas University and Kansas State University, both of which have division 1 sports departments where you can go enjoy a game of baseball or football with thousands of other fans and students.